When you want to go beautifully blonde—and go there fast—NEW Blonde Life Crème Lightener turns up the power and rockets you to bombshell status in no time flat. With bond-building Arginine and moisture- locking exotic oils, Joico’s fastest lifting crème lightener delivers up to 9+ levels of lift and beautiful, shiny- looking hair that will blow you away. Exotic oils and bond-building Arginine make this next- generation crème lightener the perfect blonding choice for on- or off-the-scalp techniques. 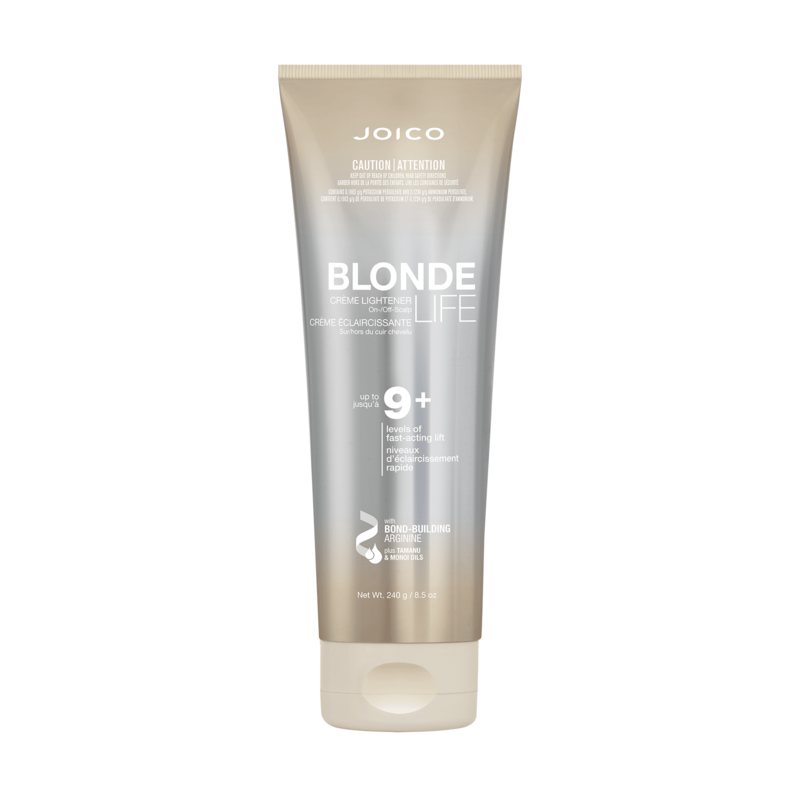 * Against combing breakage on damaged hair, when used with Joico Blonde Life® Brightening Masque. Blonde Life Crème Lightener takes you to new heights quickly and safely, delivering consistent, beautiful blondes. Mix 1:1 or 1:2 (Quantity of developer may be varied to achieved desired consistency.) Developer: 10 volume (3%) or 20 volume (6%) LumiShine® or Veroxide® developer. 30 volume (9%) & 40 volume (12%) not recommended for use on scalp Process up to 60 minutes. Developer: 10 volume (3%), 20 volume (6%), 30 volume (9%), or 40 volume (12%) LumiShine or Veroxide developer. Process up to 60 minutes. Rinse hair thoroughly. Shampoo with Blonde Life Brightening Shampoo. Rinse well. Apply Blonde Life Brightening Masque and leave in for 5 minutes. Rinse thoroughly and towel-dry hair. Mist on Blonde Life Brightening Veil and style as usual with your favorite Joico products.